Students at Mission High School stage a protest for the weekly video announcements. After discovering the extent to which some schools had been preparing for Thursday’s Day of Action protesting budget cuts, district officials sent a memo reminding administrators and teachers that they are prohibited from using school time to plan for the protest. The memo moved Mission High administrators to cancel a student-led assembly scheduled for Monday, and later that afternoon, teachers gathered at a union meeting to decide whether to continue with plans to march out of school more than an hour early on Thursday. “All hell’s breaking loose,” warned Principal Eric Guthertz at the start of the meeting, encouraging the two-dozen teachers to adhere to district concerns over safety and liability. When he left, however, teachers voted to continue the day largely as planned. While expressing frustration and outrage at the $113 million slashed from the city’s education budget over the next two years, school district leaders made it clear they opposed the use of instructional time for pre-rally planning. Listing safety as a chief concern, the district set out directives – any activities in support of the rally should take place after school, no marches should be coordinated by school officials, and student walkouts would not be condoned. Despite such caution from the district, teachers at Mission High have taken the lead in building momentum. At the Monday meeting, peer resources teacher Jennifer Colker spoke in favor of continuing with the walkout as planned. The Monday meeting confirmed that a teach-in during first period on Thursday will be devoted to educating students on the history and importance of public education, and the impact of impending cuts. While many newer teachers are under threat of losing their jobs with class sizes set to increase, students said they are most concerned with the loss of summer school. In deference to the principal’s authority, teachers decided to stagger the time they leave for the march, with some leaving at 2 p.m. as planned, and others marching after school ends. A school-wide rally will be held after lunch, with speeches from students and teachers. Fifteen schools will meet at 24th and Mission streets at 3 p.m., including 12 elementary schools that will lead the way and set the pace. “Schools found out we were organizing so they decided to come meet us,” said Libson. In contrast, administrators at John O’Connell High School in the Mission were adamant that no class time would be devoted to preparation for the rally. Principal Rick Duber said information had been sent to families so parents could make the decision whether to participate, but nothing had been organized. Teachers at the school were reluctant to discuss whether they’d even spoken with students about the issue. As at Mission, students ranged from apathetic to inspired. Some appeared keen on using the protest as an excuse to stay home and watch TV, while others were actively engaging with fellow students to promote the rally. O’Connell’s student council was considering attending as a group. 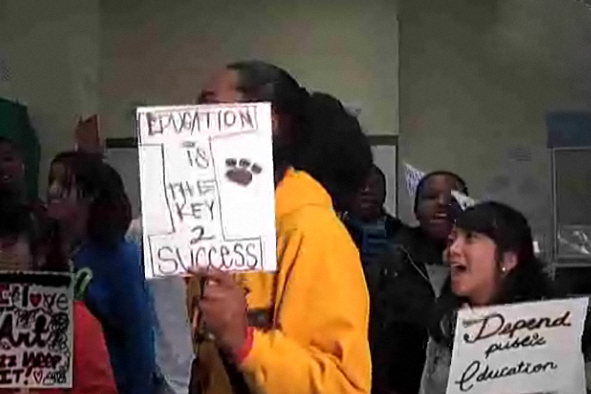 But the school is not organizing for the march, and student walkouts were being discouraged. “On the west side of the city, at schools like Lincoln, students are taking the lead,” said Mission High teacher Kathleen Cecil. In this neighborhood, she said, it was more teacher-driven than it should be. “Unless it’s about immigration, it’s hard to organize this side of town,” she said. To incorporate this issue into her class, Cecil had her 10th grade English students dissect an article from Sunday’s San Francisco Chronicle about the March 4 rally. She said her students thought the article wasn’t very well balanced, too much in favor of the protests, with only one voice saying the rally wouldn’t have much impact. Cecil, like other teachers, said she wants students thinking about the issue, rather than simply mobilizing them. “I want them to have a voice and know to speak up if something arises against them,” she said. Mission has moved its rally to the football field behind the school after a permit was turned down for a more visible gathering on the front steps. Another teacher, who had requested a permit for neighborhood musicians to perform, said it was also denied by police at the Mission District station. “I was shut down rudely and disrespectfully,” said the teacher at the Monday union meeting. “We’re going to have to unfortunately do a lot more of this in the future,” Libson said. Born in the central valley of Massachusetts and raised in Tidewater Virginia, Garrett attended public schools before graduating from the University of Virginia. Wandering and working in various national parks, tutoring kids on the playgrounds of Dublin, and teaching English to 3rd graders in China eventually led to some temporary confusion, and a re-settling as a community journalist.